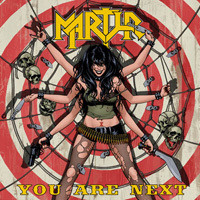 Hailing from the lowlands of The Netherlands, having a history dating to the early Eighties, and not to be confused with the black metal band, Martyr returns with You Are Next, their fourth album, if I'm counting correctly. This being my first experience with the band, I can't speak to their heavy metal roots. However, listening to this album, the band offers a hybrid of heavy, power, and thrash metal. That's probably the best part of Martyr and this album, their heavy metal sound. 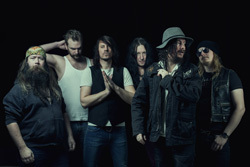 They conjure up brash, bold sharp riffs from twin guitars, flashy guitar solos, and an intense thundering rhythm section. They can go from lightning pacing as with Infinity to something steadier, heavier, even foreboding with Unborn Evil. Yeah. The Martyr heavy metal sound is convincing. But this is where my praise ends. On the first spin, I gave up listening after that latter song. Why? The vocals. I don't think vocalist Rop van Haren can sing. Or he just sings poorly. Or he's trying to be all things to all people, like going from a classic melodic and clean metal singer to a raw and harsh modern metal singer. He doesn't sound too bad at the start with Into The Darkest Of All Realms being somewhat melodic but, even so, he also sounds muted in the mix. But from there he just got worse, devolving into those harsher vocals, at least to my ears. I gave up. When it comes to any music, notably heavy metal and hard rock, if the vocals don't fit, they don't carry the music, and I'm put off. Basically, then, I didn't like this album, will not be listening to it again, and can only recommend it with reservation. You need to check out the tunes and convince yourself. Basically, because of the poor vocals, I didn't like this Martyr's You Are Next, will not be listening to it again, and can only recommend it with reservation. You need to check out the tunes and convince yourself.